ZERO CARBON BUILDINGS - There are not many buildings in England that are heading towards reducing their carbon footprint to below 1990 levels. Herstmonceux Museum is one such building, but the clever planners at Wealden District Council are doing their best to prevent the Trust and other contributors from doing just that. If this is an example of local authority interference - and we have every reason to believe that it is - then Her Majesty's wishes as in the goals of the Climate Change Act 2008 are not going to be met by 2050 or ever. What a disappointment for the United Nations this is going to be. (1) The principal purpose of this Act is to enhance the United Kingdom’s contribution to combating climate change. (c) the desirability of securing a diverse and viable long-term energy supply. (b) may from time to time publish revised energy measures reports. (2) Every local authority must, in exercising any of their functions, have regard to the most recently published energy measures report (if any). (d) reducing the number of households in which one or more persons are living in fuel poverty. “low-emissions source or technology” means a source of energy or a technology mentioned in subsection (2) of section 26. WEALDEN DISTRICT COUNCIL - We can only report on what is happening local to us. You will need to see if your local authority are acting for the common good, or if they are doing the same as our climate dimwits in Sussex. This is as of January 2019. We hope that by 2020 we can say that our climate fools have either been on a climate awareness course, or that planning-speeding has been outlawed - preferably by statute. Because we all know that if there is a loophole or any gray area at all, this council will use it to make another fast buck. (b) publish a statement of that fact together with a copy of the target or targets. (2) But subsection (1) does not apply unless on 1st November 2008 the Secretary of State considers that it would be appropriate to designate one or more targets under that subsection. as at a date specified in the target (“the target date”). (d) the results of any research carried out into the effect that designating a target under subsection (1) could be expected to have on the number of microgeneration systems that are installed in England and Wales, and the number of electricity microgenerating systems that are installed in Scotland, by the target date. (5) If a target is designated under subsection (1), the Secretary of State must take reasonable steps to secure that the target is met. (6) If the Secretary of State does not designate a target under subsection (1) he shall publish forthwith a statement of his reasons. (7) At any time before the target date, the Secretary of State may review a target and, if he considers it appropriate to do so, revise the target. (b) the revised target is treated for the purposes of subsection (5) and section 5 as a target designated under subsection (1) (in place of the target which has been revised). “plant” includes any equipment, apparatus or appliance. (1) This section applies if a target is designated under section 4.
and as if, in subsection (1C), for “subsection (1A)” there were substituted “subsections (1A) and (1BA)”. (d) “sustainable energy report” means a sustainable energy report which is required to be published under that section. (1) The Secretary of State shall for the purpose mentioned in subsection (2) carry out a review of the effect in England of development orders made by virtue of section 59(2)(a) of the Town and Country Planning Act 1990 (c. 8) (which confers power by order to grant planning permission for development or a class of development specified in the order). (2) The purpose of the review is to enable the Secretary of State to form a view as to what provision (or further provision) such development orders should make to facilitate development in England consisting of the installation, within the curtilage of a dwellinghouse, of equipment, apparatus or appliances for microgeneration. (3) As soon as reasonably practicable after he has carried out the review, the Secretary of State must lay before Parliament a report of the review, including his view as mentioned in subsection (2) and the reasons for it. (4) The report must also set out what provision (or further provision), if any, the Secretary of State proposes to make in development orders by virtue of section 59(2)(a) of the Town and Country Planning Act 1990 in consequence of the review. (b) exercise those powers as soon as reasonably practicable after laying the report before Parliament under subsection (3). “flat” means a separate and self-contained set of premises constructed or adapted for use for the purpose of a dwelling and forming part of a building from some other part of which it is divided horizontally. “(xxiie)the production of heat or the generation of electricity by microgeneration (as defined for the purposes of this paragraph by building regulations),”. (f) use in their area of, or of electricity generated, or heat produced, from biomass or any such fuel. (1) It shall be the duty of the Secretary of State to take such steps as he considers appropriate to promote the use of heat produced from renewable sources. (2) For the purposes of subsection (1), heat produced by any plant is produced from renewable sources to the extent that the plant is fuelled by renewable sources. (c) the production of heat by plant which is fuelled partly by renewable sources and partly by other sources. 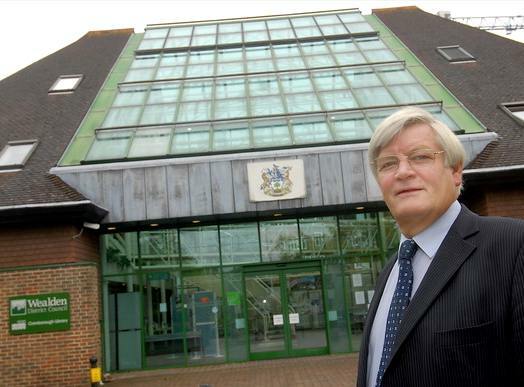 IS HE OUT OF TOUCH - Councillor Robert Standley is still the Leader of Wealden District Council - a council that appears not to take climate change seriously, let alone their responsibilities under the 2008 Act. Many are now saying that after (probably) too many years in office that members become jaded and out of touch with what is required for the sustainable future of Wealden residents. Under the lead of Bob Standley, as he prefers to be called, Wealden have adopted an enforcement led approach, rather than a more helpful negotiation first approach. Such tactics are not sympathetic to a circular economy, where most planning matters can be resolved by talking about ways that compliance might be achieved. The problem here is that negotiation is far removed from alternative agendas, such as trying to hide past mistakes. We think that new leadership is long overdue. Do you have confidence in your council? Perhaps Robert should think about his management team. Replacing non-performers might be a good start and something for this councillor's successor to consider when aiming for sustainability. Microgeneration technologies are seen as having considerable potential by the Government. Microgeneration involves the local production of electricity by homes and businesses from low-energy sources including small scale wind turbines, ground source heat pumps and solar electricity installations. The Government's own microgeneration strategy was launched in March 2006 was seen as a disappointment by many commentators. In contrast, the Climate Change and Sustainable Energy Act has been viewed as a positive step. Councils are bound by the tenets of the Climate Change and Sustainable Energy Act 2006 and the Climate Change Act 2008 to reduce greenhouse gas emissions to 1990 levels. Our Government has given all local authorities until 2050 to achieve that goal and do their part. Fat chance. The problem here is that planning departments do not really understand the physics sufficiently to know what they are looking at - never mind being creative enough to find innovative ways to bring about the reductions in their area (pro-rata) that Whitehall have set down as a statutory requirement. A BRIGHT FUTURE - The sun rises over Lime Park in January of 2017. Frost on the Jeep in the foreground is vaporized, causing the roof of the vehicle to steam. UNFCCC negotiations led to the Kyoto Protocol in 1997. The Kyoto Protocol set a target for 37 industrialised countries to reduce their emissions by an average 5% below 1990 levels, for the period of 2008 to 2012. As part of this group the UK committed to a 12.5% reduction in greenhouse gas emissions. The targets were met successfully. Overall, the 37 countries reduced global emissions by over 10%. But this was not enough to offset the increasing emissions from other industrialising countries (such as China), meaning total global emissions grew over the period. A second Kyoto commitment period has been agreed from 2013 to 2020. Fewer countries have signed the second commitment agreement, although the UK and the EU are participating. Continuing UNFCCC negotiations led to the Paris Agreement in December 2015. The Paris Agreement is the first truly global effort to reduce emissions. To date, 160 UNFCCC parties have made voluntary pledges to reduce emissions up to 2030, including China, the US and the European Union (on behalf of the UK and other EU nations). The main aim of the Paris Agreement is to hold the increase in global average temperature to well below 2°C above pre-industrial levels and to pursue efforts to limit warming to 1.5°C. Overall, the current pledges would lead to lower global emissions compared to previous expectations. But further action will be required to keep warming to below 2°C or 1.5°C. Recognising this gap in ambition, the Paris Agreement schedules a review of pledges in 2018 so that countries can tighten them where possible. There will be another review in 2023 and further reviews every five years after that. The UNFCCC commits all signatory nations to formulate, implement, publish and update measures to prepare for the impacts of climate change, known as ‘adaptation’. It also commits countries to cooperate on adaptation and provides a variety of support mechanisms for the implementation of adaptation measures in developing countries. In 2010, the Cancun Adaptation Framework was adopted, and it was agreed that adaptation must be given the same priority as mitigation. The framework calls for further action on adaptation including reducing vulnerability and increasing resilience to climate change in developing countries. The Paris Agreement also places significant emphasis on the need for adaptation action around the world.